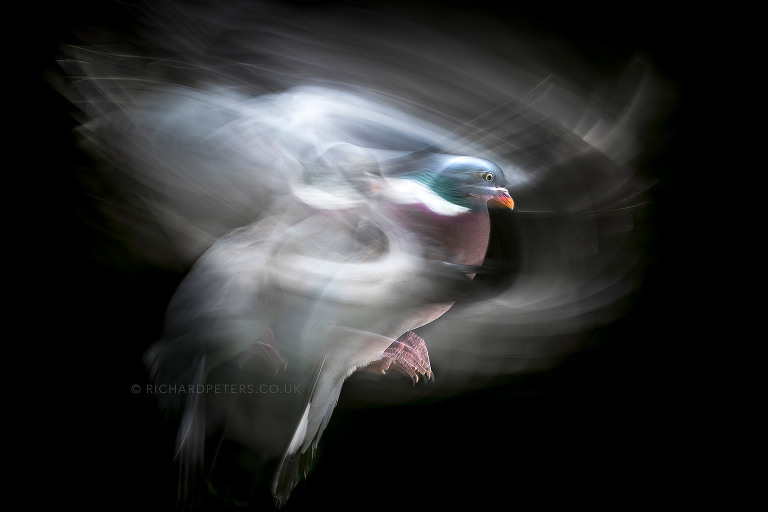 The results are out and I am pleased to share the news my photo of wood pigeon, entitled Beautiful Chaos, has been highly commended in the 2017 GDT European Wildlife Photographer of the Year. It’s a photo I took around 15 months ago but, aside from at several talks, I’ve not openly shared it before, so I’m thrilled the first time is in this way. I’m often asked what my favourite animal to photograph is. The answer is always that I’m truly more interested in the quality of the overall photo than the subject within. I often add that I’d rather a good photo of a pigeon over a standard image of something more exotic. The theory goes that the more unique and interesting a photo of a common subject is, the more memorable the photo. For many years I’ve noted that whilst pigeons are not the most graceful birds in flight, the white streaks from their feathers make some interesting shapes and patterns. It’s something that has always been at the back of my mind as having potential for an interesting photo. The idea for how to capture it finally presented itself in my garden, when two local wood pigeons would fly across from my shed to the bird table to raid the seeds and nuts on offer, before any other birds would come in. With a reliable flight pattern observed it allowed me to go through some trial and error in capturing their flight. First putting the camera close to the bird table with a wide angle then eventually pulling the camera further back and using a telephoto. The trick to this image was in observing the way the light fell on the garden at different times of the day. Then, by combining natural light with a pop of defused flash at the end of the exposure, I was able to freeze the pigeons head and provide an anchor point to contrast against the motion. Capturing unique photos of common subjects can be tricky, especially when they are technically challenging. If you have an idea it’s always worth putting the time in to work out how to capture it and in this instance, Beautiful Chaos marks the 6th award across five international competitions from photos taken in my garden from my year long project. It’s a project I put a lot of work into a couple of years ago but if you’d like to know more about it, please do check out my ebook Back Garden Safari.